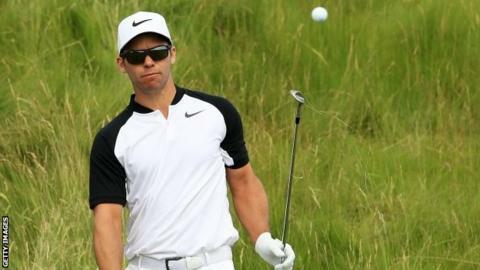 English duo Paul Casey and Tommy Fleetwood are in a four-way tie for the lead after two rounds of the US Open. Casey posted a one-under 71 to move to seven under, while Fleetwood and Americans Brian Harman and Brooks Koepka signed for 70s at Erin Hills. For the first time since world rankings began in 1986, the world's top three have missed the cut at a major. Defending champion Dustin Johnson (+4), Rory McIlory (+5) and Jason Day (+10) finished above the one-over-par cut. Overnight leader Rickie Fowler was going on serenely at nine under until three successive bogeys from the 11th saw him drop back into the pack. The American recovered to post five pars and salvage a one-over 73 to sit one off the lead, with Jamie Lovemark and JB Holmes who both shot 69s. World number one Johnson, who recorded his first major victory in this tournament at Oakmont a year ago, flirted with the projected cut mark all day. He opened on three over but birdied the first two holes. However, he was unable to build on that momentum and was still one over par after a birdie on the 12th. Bogeys on the 13th and 14th dropped him back to three over and a further shot went on the 17th. Northern Ireland's McIlroy, who was playing his first tournament after a month out injured and only his seventh of the year, signed for a one-under 71, after knocking in four birdies in his final six holes, but the damage was done by his six-over 78 in round one. "I showed up for the last six holes at least," joked world number two McIlroy, who misses his second successive US Open cut. "I saw some positives on the back nine to take into next week and, even though this is disappointing, the last two rounds will serve me well in this busy summer." World number three Day followed his opening 79 with a 75 to limp out on 10 over. "It's been the best preparation going into a major in my career," said the Australian, who conceded: "I was in the hay too much over the last couple of days." After opening with a six-under 66, Casey was one off the overnight lead as he went out among the early starters on Friday. He started on the 10th, birdied the 11th but bogeyed the 12th before coming unstuck on the 14th. He was within 100 yards of the green after two shots but hit his third in to deep rough and took five from there to post a triple-bogey eight. A bogey on 15 dropped him to two under but a run of five birdies followed to catapult him to the top of the leaderboard. "It's very difficult to get through a major championship, let alone a US Open, without a blemish on your card," the 39-year-old told BBC Sport. "I made a complete mess on the 14th. It's how you react to it. I tried to take my medicine and then messed up the next hole. But I got on a wonderful birdie streak. "It was important to do that. I didn't change the game plan. John, my caddie and I kept communication great. We talked it out and got back to hitting the fairways and doing the basics and that led to some birdies on the front nine. I'm really, really happy with it." Southport's Fleetwood said it would be "nice to sit down to dinner knowing you're top of the US Open leaderboard" after overcoming "a ropey start" to his second round. The 26-year-old bogeyed the first hole but had three birdies and 12 pars before dropping his next shot on the 17th. However, he finished his round well with a birdie at the par-five 18th. "I was enjoying it," he told BBC Sport. "I had a couple of bad drives early in the round and I had to focus on my rhythm and slow things down but as I got into the round it became more natural and I hit a lot of good shots and felt comfortable out there. "I've never led a US Open, so it will be a very cool experience." Japan's Hideki Matsuyama posted the joint-lowest round of the day, a seven-under-par 65 to move into a tie for eighth on five under. The world number four knocked in six birdies on the front nine and one more on the back nine in a bogey-free round. However he missed an opportunity to tie Jonny Miller's US Open single round record of eight under when his nine-foot birdie attempt at the last stayed up. Matsuyama is joined on five under by, among others, amateur Cameron Champ who had three-under-par 69. American Chez Reavie also leapt up the leaderboard with a 65 to get to four under - he had eight birdies and one bogey - and missed a 25-foot putt to tie Miller's 1973 record on the short ninth. Masters champion Sergio Garcia kept his challenge on track with a solid one-under-par 71. He signed for three birdies and two bogeys to finish three under, alongside 2014 US Open winner Martin Kaymer (69) and Austria's Bernd Wiesberger (72). American Jordan Spieth, winner in 2015, birdied two of his first four holes to get to one under but a bogey on the sixth checked his progress as he posted a one-under 71 to move to level par. With the cut coming at one over, the joint-lowest 36-hole mark in US Open history, the 68 players who will contest the final two rounds are all within eight shots of the lead - the same number of shots Matsuyama made up on playing partner Fowler in round two. Olympic champion Justin Rose is another who will be heading home early after carding a two-over 74. The Englishman, champion in 2013, birdied the par-five seventh to move to level par but bogeyed the next two to finish the tournament on two over. In fact, of the 14 Englishmen, three Scots, two Northern Irishmen and one Welshman who started on Thursday, only seven will play the weekend. Andrew Johnston is five off the lead after a 73, while fellow Englishmen Eddie Pepperell (71) and Matt Fitzpatrick (73), and Scotland's Martin Laird (71) are in a group on one under. Lee Westwood had a three-over 75 to drop back to level par. Among those missing the cut were Bradley Dredge of Wales and England's Chris Wood on three over while 2010 champion Graeme McDowell closed on five over. England's 2016 Masters champion Danny Willett, who posted a nine-over 81 in round one, withdrew before the start of his second round with a back injury.